1. Tax bill crunch time: Republican efforts to make drastic changes to the U.S. tax code are center stage in Washington. It’s a full court press: President Trump is expected to meet with congressional leaders, and the House will start debate on its bill. If successful, the tax overhaul would be the Republicans’ first substantial legislative victory under Trump. The major question for investors is whether the House and Senate Republicans will be able to reconcile their competing versions of the plan without losing votes. One sign of trouble: Sen. Ron Johnson became the first Republican to formally come out against his party’s plan on Wednesday. 2. Markets rebound: Global markets are swinging higher after several days of rough trading. 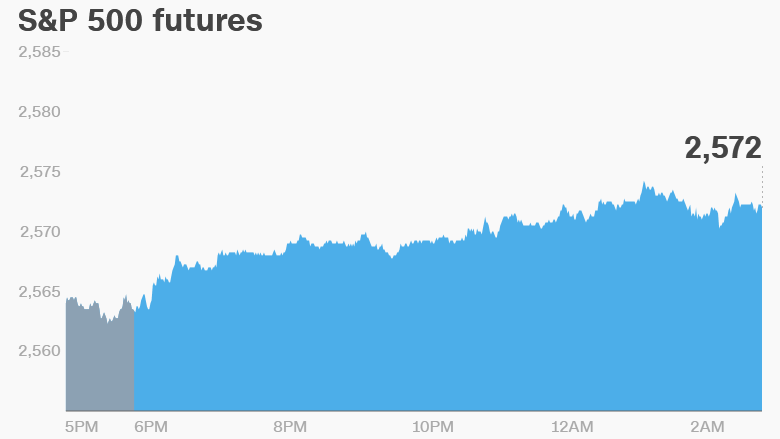 U.S. stock futures were up and European and Asian markets were higher. Oil prices rebounded to gain 0.3%. The Dow Jones industrial averageand the S&P 500 closed 0.6% lower on Wednesday. The Nasdaq shed 0.5%. 3. Volkswagen goes electric: Shares in Volkswagen(VLKPY) opened 2% higher in Frankfurt after the automaker announced plans to spend, together with a local partner, $ 12 billion on electric cars in China. China is Volkswagen’s biggest single market. The company delivered 303,800 vehicles in the country in October, an annual increase of 9.2%. 4. Stock market movers:Cisco Systems(CSCO, Tech30) shares were higher in extended trading after the company said it expects revenue to jump after two years of declines. 5. Earnings and economics:Best Buy(BBY), J.M. Smucker(SJM), Viacom(VIAB) and Wal-Mart(WMT) will release their earnings before the open, while Gap(GPS), Haynes Intl(HAYN) and Williams-Sonoma(WSM) will follow after the close. The Bank of England is holding a forum in Liverpool. Officials will discus the state of the U.K. economy and how the central bank’s policies affect Britons.